Despite the overwhelming challenges faced by its members and descendants over nearly 200 years, the MBCI continues to cultivate their heritage, freedom and self-determination. 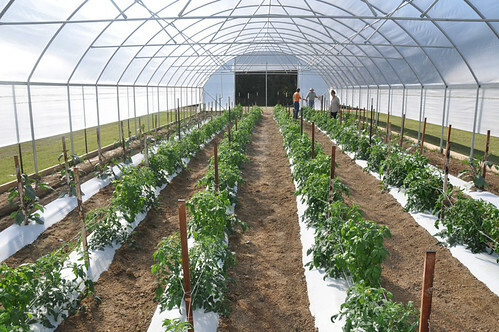 Choctaw Fresh Produce, a tribally-owned producer and distributor of USDA certified organic fruits and vegetables, produces its crops under 15 high tunnels at five separate sites at different tribal communities. While capital intensive at start-up, the tunnels allow for better water control and expand the growing season by approximately two months. Among other items, Choctaw Fresh Produce produces and distributes beets, bell peppers, carrots, collard greens, cucumbers, eggplant, lettuce, onions, spinach, squash, tomatoes, watermelons, and zucchini. The produce is sold in select grocery stores, farmers markets, and through a Community Supported Agriculture (CSA) program. CSA programs enable community members to have access to fresh produce, made available or delivered every week during an operation’s growing season. Furthermore, CSA programs help revitalize local farm communities, rebuild local food systems, increase the supply of local, fresh and unprocessed foods, and ensure fair returns for farmers. Choctaw Fresh Produce also produces fresh, locally-grown fruits and vegetables for Tribal schools, the Choctaw Health Center Diabetes Prevention Program, and a resort on tribal lands. Furthermore, the company is helping the community to better understand food production systems by providing scheduled tours for schools and other community groups. Despite the overwhelming challenges faced by its members and descendants over nearly 200 years, the MBCI continues to cultivate their heritage, freedom and self-determination. Honoring their past, they are creating a better future by producing and distributing USDA organically certified fruits and vegetables. Congratulations and best wishes for continued success to Choctaw Fresh Produce.